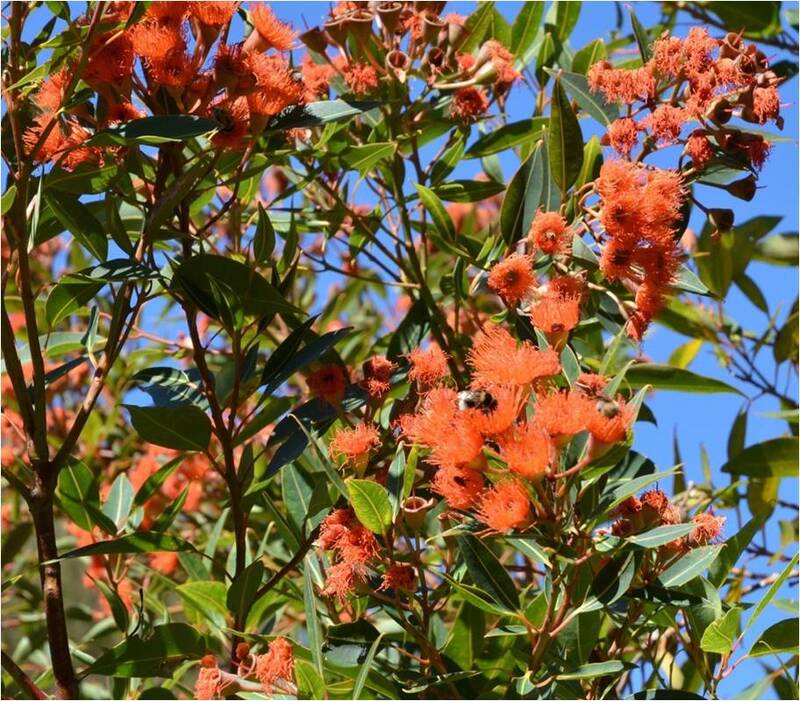 Editor of our newsletter and trustee Mike Halliday talks about the Corymbia (formerly Eucalyptus) Ficifolia. While it is true that Australians aren’t backward in coming forward, the real “show–off” in our Australian section this year has been the collection of Flowering Gums (Corymbia Ficifolia). Most of you, I am sure, will immediately blink and say “what’s with the name change?” Well about twenty years ago 113 eucalypts in the Ghost Gum, Bloodwood, and Spotted Gum groups were re-classified by botanists as being Corymbia as opposed to Eucalypts. This has proved a little controversial with some refusing to accept the change. However, we digress! While still only small trees, they have put on quite a show with a range of colours from orange to dark pink, and have been a haven for the local Tuis, Bellbirds, and of course bees. Busy bumble bees enjoying the orange flowers. The tree itself originates from a small area just west of Albany on the south coast of Western Australia, where it enjoys a 1500mm (60 inch) rainfall, and grows in poor sandy or gravelly soil. It obviously adapts to other soil types, as it can be seen growing on a variety of sites around Hawke’s Bay, the best known probably those on Tom Parker Avenue in the Napier suburb of Marewa. Mature trees have a rough bark, and only reach a height of 10-15 metres, the seed capsule is quite large and often used in floral arrangements. At this stage the trees at Guthrie-Smith appear healthy, but can be subject to attack from the Eucalyptus tortoise beetle (Paropsis Charybdis). Why not make a trip to the Arboretum next summer (Jan/Feb) to catch the flowers? Ref. Kelly, Chippendale and Johnston; “Eucalypts Volume 1”.